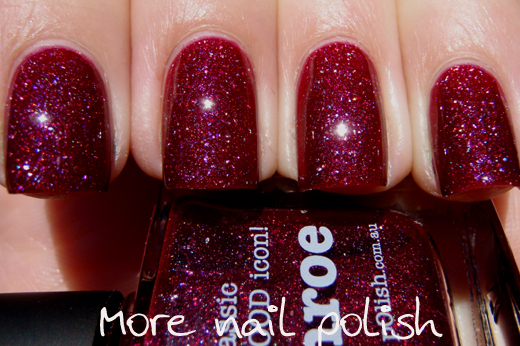 You may have seen some sneak peak photos of the new reborn version of Picture Polish Monroe on their Facebook site. Here are lots more photos and some more comparisons to the old version. This is three coats of Monroe with a coat of Seche Vite top coat. As you can see, this polish now has those gorgeous larger scattered holo flakes - the same ones that are in Kryptonite and the Ozotic 600 series. 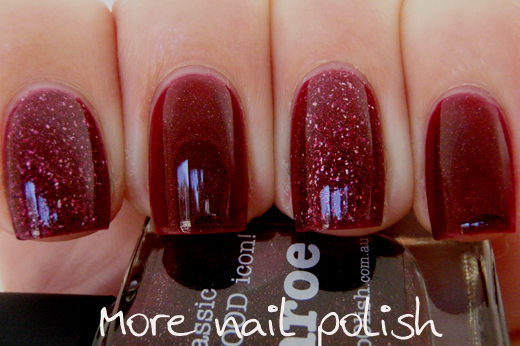 What I love out this polish is that it's like a darker vampier version of Ozotic 621. Compared to the first version of Monroe, which was a little tricky with application to get it all smooth and non streaky, I found this version to be much easier to apply and it seemed to self level a lot better. I could have got away with two coats, but I love the depth that three coats provided. Here are the comparison photos. 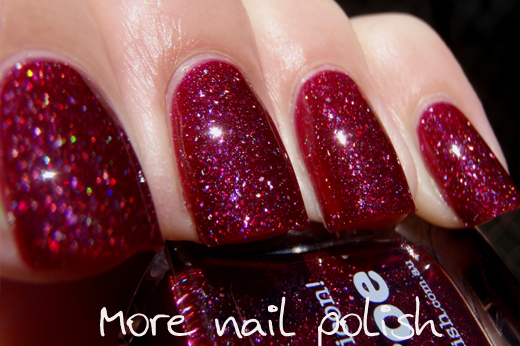 You can really see how much sparklier the new version is, which is on my index and ring fingers. 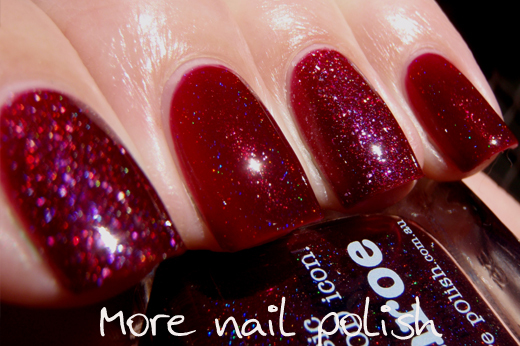 The older version has a really subtle holo effect that you can just see in these photos. The jelly blood red base looks to be the same in both polishes, but because of the sparkles, the new version looks a little pinker where the holo particles reflect blue and purple hues. The reborn version of Monroe is available from Picture Polish for $11.50AUD or through their Network members (price varies). I love both versions and I'm glad I have both in my collection, they are similar yet quite different. Which is your favourite? Ooh the new version looks very pretty also! Love the look of this reborn version, definitely going to need to pick it up. 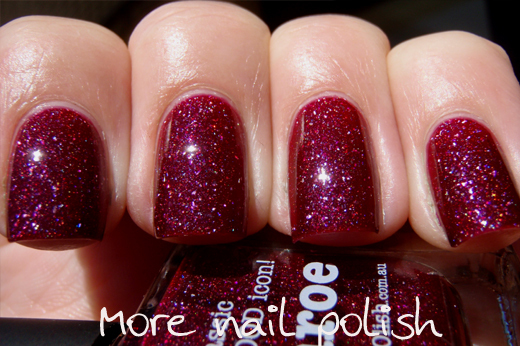 The original looks like something that could be achieved with the right coloured jelly and Jessica holo topcoat. I couldn't imagine how I'd get the look of the new one which is so totally more fabulous! 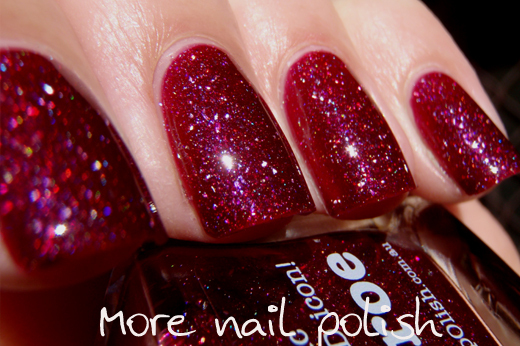 I like the new version better, I just love sparkle! I like the new version much better than the original. In fact, I was kinda disappointed in the original with it's application. I love both of them! 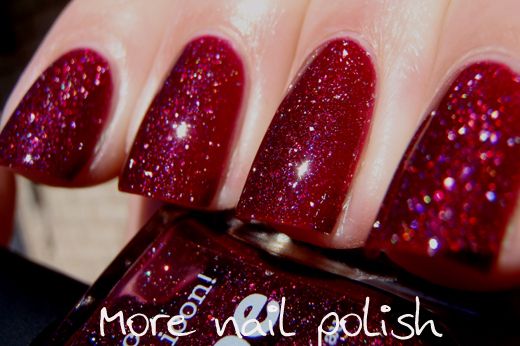 I feel like Marilyn would have both of these types of polish in her arsenal :) Great swatches! Am I the only one who likes the old version better? me 2!!! but i saved up and bought the old version, so so glad i have it! This new version seems to be better, now I'm really in love with Monroe. I like the new version better. Both are pretty, but the new one is much less conservative and fun looking. Darn I knew I shouldn't have waited 2 buy it, all the glitter ruined it. I don't understand why it's named the same-should have been renamed-it's not the same color. Thanks for posting this...I have both, and I think I like the new version better but the older version will be awesome for layering! Hands down the new version! 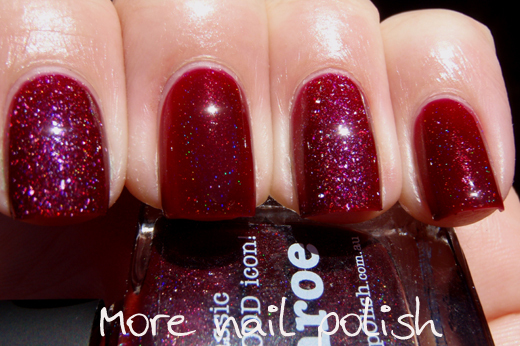 I'm not much of a fan of the barely there bijou holos.